Win The Terror, Live: Experience South Korean suspense | SWITCH. Ha Jung-Woo ('The Chaser') stars in 'The Terror, Live' as a disgraced former television news anchor who unwittingly takes a call from a terrorist on his live radio show. When the terrorist's threat to blow up the nearby Mapo Bridge in Seoul proves to be frighteningly real, Yoon Yeong-Hwa (Ha Jung-Woo) decides to use the unfolding incident as his way to get back in the spotlight. With the Mapo Bridge left in ruins, Yeong-Hwa readies himself for another call from the unidentified terrorist, transforming their conversation into a gripping live television broadcast. Soon though, this deadly cat and mouse game gives Yeong-Hwa more than he bargained for. Fighting for his career and now, his survival, Yeong-Hwa must navigate the simultaneous demands of his ruthless producer and the terrorist in his earpiece. Writer/director Kim Byeong-Woo puts forth a captivating offering which is nail-biting and thought-provoking in equal measures. 'The Terror, Live' includes compelling performances from Korean superstar Ha Jung-Woo and veteran Lee Kyeong-Leong. The 'The Terror, Live' competition has now closed. Winners will be announced shortly. Competition opens at 6:30pm AEDT on Sunday 12th October 2014 and closes at 11:59pm AEDT on Sunday 19th October 2014. Five winners will be chosen at random on Monday 20th October 2014. To successfully win, entrants must fulfil the above entry conditions before the time the competition closes. Current members/followers are eligible to enter the competition. Only one entry per person. Only one winner per household. To be a valid winner, the entrant must not have won a prize from SWITCH within the last 28 days. Each winner will receive one Blu-ray copy of 'The Terror, Live'. By entering, you agree to receive occasional emails from SWITCH in the future. If you decide to unsubscribe from these updates, any further entries will not be applicable. Only Australian residents are eligible to enter. 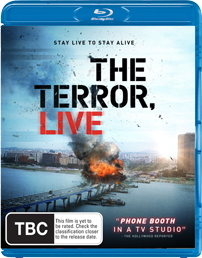 'The Terror, Live' is available on Blu-ray, Digital and DVD on Wednesday the 15th October 2014 from Icon.